A proposal to increase the state excise tax to boost funding for Hawaii public schools and the University of Hawaii will not get a hearing in the state House and appears to be dead for this year. Senate Bill 1474 would have increased the state excise tax to 4.5 percent from 4 percent to provide hundreds of millions of dollars in extra funding each year for higher and lower education, but House Finance Chairwoman Sylvia Luke said Thursday she will not consider the measure. Star-Advertiser. A jury verdict linking Roundup to a California man’s cancer could help bring large payoffs to Hawaii residents. Five former and current Hawaii residents have sued agribusiness giant Monsanto, saying repeated exposure to the weedkiller caused their cancer. Hawaii News Now. State Historic Preservation Division to Implement “I Mua Mondays”. On all Mondays, SHPD offices statewide will be closed to the public and SHPD will not accept meetings, phone calls, emails or “walk-ins”. SHPD’s Library will also be closed on “I Mua Mondays.” Maui Now. State jobless rate remained at 2.7% in February. 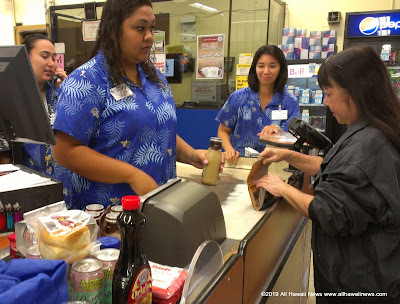 Hawaii’s gradually rising unemployment rate paused in February amid a slowing growth trend that local economists have been forecasting for the state. Star-Advertiser. Local coffee: Boosting blends to 51 percent? Under the coffee labeling bill moving through the legislature, there could be a dramatic increase in the amount of local coffee in the blends you drink at restaurants and buy at the store. KHON2. Prison reform frustrations: Bills to address overcrowding stalls in Senate. Overcrowded jails in Hawaii is a problem that has at least one State lawmaker claims the legislature this session is doing nothing about. KITV. Micronesian official to plead guilty in bribery scandal. A government official from the Federated States of Micronesia is scheduled to plead guilty in U.S. District Court next month to conspiring to launder bribe money he solicited from a Honolulu engineering contractor. Star-Advertiser. Turtle conservation rules cut Hawaii’s swordfish season short for 2nd year in a row. Swordfish season typically run through the month of June. But the 15 boats that make up Hawaii’s shallow-set longline fleet are sidelined for now. Hawaii News Now. Hawaii's rent supplement initiative funds expected to run out later this year. KITV. Ozawa-Waters battle heating up. With the special election for City Council District 4 fast approaching, Trevor Ozawa and Tommy Waters are seeking to draw voters’ attention to each other’s perceived weaknesses. Star-Advertiser. Car racing fans push for a track at Barbers Point. A state Senate committee will hold a hearing today on a resolution “expressing support” for a racetrack on 220 acres at the former Barbers Point Naval Air Station that backers want initially for coned-course driving but could expand to quarter- mile, oval and dirt bike racing. Star-Advertiser. Honolulu police officers Thursday morning rolled into the Walgreens parking lot on Young Street and ordered three homeless people to leave the private property — part of an ongoing effort to remove a particularly stubborn group of five to 10 chronically homeless people from the area. Star-Advertiser. The University of Hawaii John A. Burns School of Medicine and University of Hawaii Cancer Center is hosting a panel on medical cannabis for cancer from 1-3 p.m. Saturday at 651 Ilalo St. Star-Advertiser. Highway 132 Restoration Funding Bill To Go Before Council. The Highway 132 recovery project that lava-locked residents of Puna have been clamoring for will be added to the Hawaii County Capital Budget, if the Hawaii County Council approves Bill 46 during its meeting in Kona on March 28. Big Island Video News. Proposed UH-Hilo cuts called ‘devastating’. While proposed budget cuts throughout the University of Hawaii system, recently recommended by the state Senate, would largely reduce unfilled positions at UH-Hilo if approved, a proposal to trim $300,000 from the school’s athletics budget would devastate the program, university officials say. Tribune-Herald. Spring has sprung: Hawaiian monk seal welcomes pup at North Kona beach. It’s said spring breathes new life into the world around us — and that was certainly true this year when Hawaiian monk seal RA20 welcomed her second pup Wednesday. West Hawaii Today. Maui is one of the fastest growing communities in Hawaii, but it faces numerous challenges including water rights, high cost of living, and a high rate of homes being used as short term rentals. Tackling those challenges will be the job of newly elected county mayor Mike Victorino. Hawaii Public Radio. Snorkeling at Molokini Crater is one of the most popular things to do while visiting Maui—but is it becoming too overcrowded? The Department of Land and Natural Resources aquatic division has been studying impacts at Molokini for a decade. KHON2. Kahoma Stream is blocked by debris, dries up. Community members worried about efforts to restore marine life. Maui News. The Hawaii Commission on Water Resource Management issued a response today concerning low stream flow reported in Kahoma Stream on Maui this week. Maui Now. Kauai Tops State For Percentage Of Unvaccinated School Kids. For the first time, the state Department of Health has released statistics on vaccination rates for individual public and private schools. Civil Beat. Lawsuit: Zuckerberg backed Andrade. The dispute over kuleana lots on Facebook CEO Mark Zuckerberg’s estate in Kilauea has spawned another lawsuit. Garden Island. The Chan Zuckerberg family is building on their support of Kauai Community College students with a new donation to support the Waialeale Project and Early College Program. Garden Island. Convention contention. The Kauai Republican Party is gathering Saturday for the county convention and recent infighting between a district chairman and the chairman points to a controversial convention. Garden Island.